Adobe today announced the Digital Negative, or DNG, file format -- a standard method of storing the raw image data that a growing number of mid-range and high-end digital cameras support. Along with the announcement comes a free utility, DNG Converter, for converting current raw-format files into DNG format. If you shoot in JPEG format and use iPhoto, this announcement isn't likely to inspire you to hoist a brewsky in Adobe's direction. However, if you're an advanced amateur or professional who wants the extra control that raw format provides, Adobe's announcement is big news. The raw format isn't really a format, but simply the raw data that comes from the camera's light sensor. Each camera manufacturer has created its own method of storing this data, and that has made more work for Adobe. Every time a new raw format appears, Adobe's engineers essentially have to crack the code and update Adobe's Camera Raw plug-in to work with the new format. The DNG format has the potential to eliminate these follies. Future cameras will simply write their raw data in DNG format -- either by default or as an option -- and any program that supports DNG will be able to open the file. There's another huge benefit. In this brave new digital age, file formats tend to become outdated or obsolete over time. How many of today's programs support the VisiCalc format or the PixelPaint format? Digital photographers who shoot in raw format have had a cloud hanging over their heads: Will their raw files be readable next year? In ten years? In 100 years? In a world where Matthew Brady's glass plates are still readable, the notion of a digital image becoming unreadable in a decade or two is a terrifying one for a photographer. The DNG format eases that terror. Convert your proprietary raw files into DNG format, and they'll be readable by the Digital Photo iPod brain implant that your great-grandchildren will be using in 2084. There will undoubtedly be some bumps on the road toward this archival nirvana. To learn more about the DNG format, check out rawformat.com. This new site is a recent addition to the Avondale Media network, and it's the place to go for links and leads to everything raw. There's also a book you must buy: Bruce Frasier's new Real World Camera Raw with Adobe Photoshop CS is the definitive guide to working with raw images and maximizing their potential. It will also teach you volumes about how digital cameras work. And finally, a shameless plug: if you like to learn by watching, check out the latest instructional DVD from us here at Avondale Media: Secrets of the Photoshop Masters, Volume 2. In it, Jeff Schewe, one of the most brilliant Photoshop gurus I've ever met, walks you through the process of converting raw files and taking full advantage of their imaging versatility. I have two older brothers, and both are superbly talented jazz musicians. Bill Heid is among the top jazz organists in the world. Many music lovers are only now discovering the might and power of the Hammond B3; I was lucky to grow up with it. I've also had the fun of seeing my brother perform at the Monterey Jazz Festival, and of bidding him safe travels when he journeyed to other parts of the world as part of the US State Department's Jazz Ambassadors program. Bill has recorded several albums on the Savant label. His Dark Secrets is one of my favorites, although I'm also partial to the more-recent Da Girl, which JazzTimes magazine called "one of the best jazz organ dates of the year." Alas, as is the case with too much great music, Bill's albums are not available on iTunes Music Store. The CDs are available at Amazon, as the box below shows. Bill has also been a sideman on some blues albums from the legendary, Chicago-based Alligator Records -- and some of them are available on the iTunes Music Store. My favorite? Fenton Robinson's 1974 release, Somebody Loan Me a Dime. Bill's piano playing is just plain perfect on the slow blues classic, Going to Chicago. Bill also plays piano and organ on Fenton Robinson's Grammy-nominated 1978 date, I Hear Some Blues Downstairs. And my other big brother? His name is George Heid, and he plays drums and percussion. He's also a brilliant recording engineer -- in the mold of the great Rudy van Gelder -- and engineers all of Bill's albums. Here's a tip of the hat to my big brothers, who have taught me so much about music and audio and life. 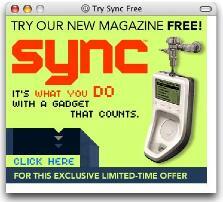 While surfing some news sites today, I was greeted by this pop-up ad. I'll pass, thanks. I'm not getting anywhere near that scroll wheel. I've been on the road at various speaking engagements, so I'm not sure when this happened. But it has: If you're a member of the iTunes affiliate program, you can now create affiliate links to specific artists, songs, and albums. I'll take advantage of this to point you to an absolutely great song on a new album of remixes from the vaults of the legendary Blue Note label. The album is called Blue Note Revisited, and the song is a remix of a Horace Silver tune called Won't You Open Your Senses. It's everything a Blue Note remix should be: jazzy, hip, updated. I discovered this album while auditioning some CDs at a Hear Music outlet in Berkeley. But was I going to pay $17 for a CD that contained only a few tracks I really wanted? Of course not. I made a mental note of which tracks I wanted, then bought them for 99 cents apiece when I got home. Alas, one of the tracks I want is available only when you buy the entire album. I hate when that happens. The devil on my left shoulder is telling me to fire up AcquisitionX and go looking for it. The angel on my right shoulder hasn't offered its opinion yet. On Saturday, I had the pleasure of speaking at the Macintosh Computer Fair, an all-day event produced by the North Coast Macintosh User's Group, the largest user group in Northern California. It was a blast, and I loved meeting readers and seeing familiar faces again. During my opening session, I talked about my upcoming trip to Europe and the research I've been doing into digital wallets to store my photos. I mentioned how my paranoia is greater in the digital age -- I've decided to take two digital wallets along so I have a backup of all my photos. Back in the days of film, of course, there was no such thing as backing up your shots while you traveled. Arlene and I visited Antarctica, Chile and Argentina in February and March of this year. Based on experience I had with a Canon Powershot G2, I upgraded to the G5 with better optical zoom and more megapixels. Great camera with great battery life. I took five CF cards of varying capacity with a total of over a gigabyte -- which I thought would be enough. We went to Antarctica first and then to the Atacama Desert in the far north of Chile. When we returned to Santiago after the Desert, my CF cards were all full. The next day, we were to leave in a rental car and drive over the Andes to Mendosa wine country in Argentina, so I either needed to buy another card (very expensive) or delete images. So, arriving at our hotel late in the evening, we decided to take the camera with us to the sidewalk cafe in the hotel for a late meal. During the meal, we would review all the images (approx. 500) and delete the rejects. When the food arrived, I placed the camera and bag on the floor to make room on the very small table. The dining area was on a platform about 18" above the sidewalk. Our backs were to the sidewalk while we enjoyed our meal and two kids grabbed the camera and bag and made off with them -- the camera and all the CF cards! Pretty dumb on our part. We've traveled all over the world and we certainly know better, but anyway it happened. Now here is why I am telling you this story. You mentioned that in the old film days you never worried about backups since it was not possible. If we had been using film, we would have not so obviously been reviewing our pictures and alerting thieves that we had a valuable camera (prices in Chile are 2X US retail). And, perhaps more important, since film is relatively bulky compared to the CF cards, we would have carried it separately from the camera (that had been our practice). Thieves don't steal film or cards -- they steal cameras, so the goal is to keep the two separated. My guess is that if an evil doer broke into my hotel room, they would grab the camera, not the film or cards -- except if they were with/in the camera. 2) A digital camera is simply another digital data collection and manipulation device -- a computer -- it needs to be backed up! Now that's a hard lesson, and I myself have learned from it. Next month, my memory cards and digital wallets will never travel in the same bag as my cameras. And I'll make it a point to keep the wallets in different places in our luggage and hotel rooms. Two backups won't be of much use if both are stolen. 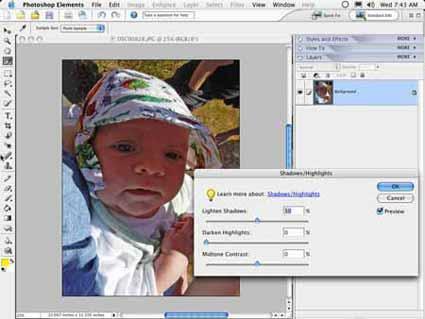 Today, Adobe announced a new version of Photoshop Elements 3, its version of Photoshop for the rest of us. Elements 3 is a great upgrade that borrows some of the best new features from Photoshop 7 and Photoshop CS, while at the same time making the entire image editing process easier and more approachable for people who aren't digital imaging gurus. Most noteworthy is a shadow/highlight recovery feature that, like its Photoshop CS counterpart, does an amazing job of bringing out details hidden in dark shadows and bright highlights. In Elements 3, Adobe has also refined the Quick Fix mode, placing key sliders along the right hand side of the screen (click the screen below to see a larger version). Also noteworthy is Elements 3's new set of healing brush tools. The healing brush first debuted in Photoshop 7, and Elements takes it one step further with the spot healing brush. Like the retouch tool in iPhoto, the spot healing brush doesn't require you to specify a source point before you use it. Simply point to a flaw and then click and drag. The standard healing brush (which does use a source point) is also available. 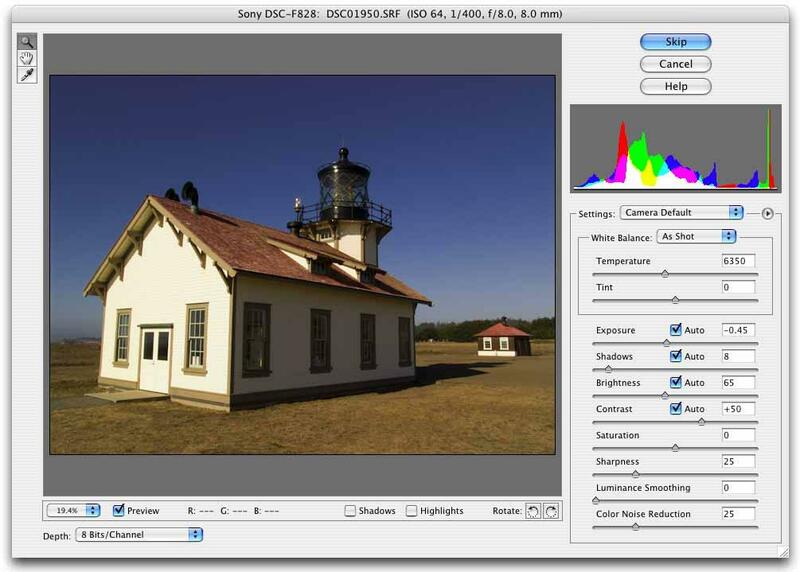 Photoshop Elements 3 also includes support for Camera Raw images. That's a first for Elements, and it's a welcome addition, now that more and more advanced amateurs are embracing the raw format. 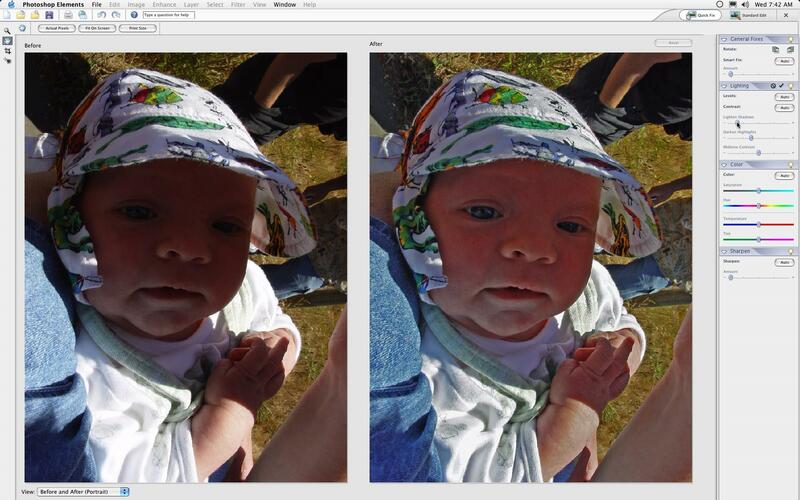 The version of Camera Raw included with Elements 3 lacks some of the capabilities of its Photoshop CS counterpart. For example, the Lens and Calibrate tabs aren't present, which means you can't fix chromatic aberration and vignetting, nor can you create a custom calibration for a specific device. Also, the Elements 3 version of Camera Raw doesn't have the impressive "up-rezing" features of its Photoshop CS big sister, nor does it let you choose a color space for the image (click the screen below to see a larger version). But still -- having raw format support in an $89 program is a good thing. If you browse the pages for the Windows version of Photoshop Elements, you'll notice it has a feature the Mac version lacks: photo cataloging. Adobe has rolled many of the features of its Photoshop Album software into the Windows version of Elements 3. But it left these features out of the Mac version, and for a good reason: we Mac users have iPhoto for cataloging. Happily, the new Elements 3 also coexists beautifully with iPhoto. You can use iPhoto's preferences command to have iPhoto launch Elements 3 when you double-click an image in your photo library. And as I describe on page 111 of The Macintosh iLife '04, you can also simply drag a photo from your iPhoto library onto the Elements icon in your dock. There's more to Elements 3, and I'll have more to say later. In the meantime, Mac shutterbugs have a lot to look forward to when the new version ships. Master the elements of iLife. The Macintosh iLife '04 is the only computer book of its kind: a gorgeous, full-color guide to all five iLife programs, plus a companion two-hour instructional DVD that's also packed with GarageBand loops, example files, software, and more. (Check out the excerpts.) All for a price even the author thinks is too low: $20.99 on Amazon.com. Attention, Northern Californians: I'll be participating in two user group events within the next week, talking about iLife and digital hub-related topics of all kinds. Let's get together! Saturday, September 18, Santa Rosa, CA. Beginning at 10 am, I'll be heading up the GarageBand track at the North Coast Mac User Group's annual Mac Computer Expo. Here's your chance to see me play a keyboard that doesn't have QWERTY printed on it. Monday, September 20, Cupertino, CA. I'll be the guest speaker at the monthly meeting of the Silicon Valley Mac User's Group. I'll be talking about The Macintosh iLife '04, showing snippets from its two-hour instructional DVD, and most of all, sharing some of my favorite tips for all five iLife '04 programs. The meeting takes place at Apple headquarters: the DeAnza 3 building, 10500 N. DeAnza Blvd, just south of Interstate 280 (click for map). The meeting begins at 7 pm in the Beatles Conference Room. At both events, I'll have copies of my iLife '04 book/DVD available at a big discount. I hope to see you there! In other words, order your Linda Tripp stamps at your own risk. 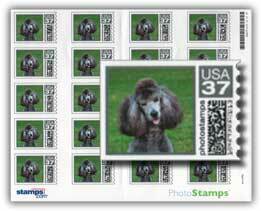 Last week, a friend gave my wife a present: a sheet of real US stamps, each one bearing a photo of Sophie, our standard poodle. They're called PhotoStamps, and they're the latest offering from Stamps.com. Stamps.com began selling them last month on a trial basis, and I'm here to tell you: they're beyond cool. The next screen lets you rotate and crop your photo and preview your stamp. (It's a great use of Macromedia Flash, by the way.) When you're happy with your budding indicium, you can place your order. A sheet of twenty PhotoStamps costs $16.99, or about twice the stamps' face value. (Additional sheets cost less.) Your image must be approved by Stamps.com, so keep it clean and keep it legal -- they won't print anything they deem to be nasty or controversial, though that hasn't stopped some people from having a little envelope-pushing fun. This morning's email brought the good news that I've been accepted into the iTunes affiliate program. Great! Now I can pollute these pages with links to my favorite songs and albums, and you'll buy them and I'll be rich. In its current state, the iTunes affiliate program has a mammoth limitation: it doesn't let you create links to albums, artists, or songs of your choosing. Instead, you must choose from a variety of prefab links. Some, like the iTunes logo in the sidebar to the right, simply hawk the music store. Others, like the banner here, promote specific artists or albums. But you can't search for an artist, song, or album and then create a corresponding affiliate link. In other words, you can promote anything you want, as long as it's something Apple wants you to promote. This needs to change, and presumably, it will: the iTunes affiliate page specifically touts the ability to "link directly from your website to any song, album or artist on iTunes." Yes, the iTunes affiliate program is in its embryonic stages. Affiliates won't even be able to get traffic and revenue reports until the middle of this month. But hopefully the ability to link to individual items will come soon. Stay tuned, and in the meantime, go shopping. Memo to Archos: Fire Your Web Developer! Enjoy Web navigation frustration in the comfort of your own home! Step 1. Go to the Archos Web site. Step 2. In the navigation bar, point to the Press item and try to choose one of the submenu items that pops up. It's fun for the whole family! I'm still researching digital wallets and other photo-storage devices for my upcoming trip to Europe. While surfing, I came across this page, which lists a huge number of devices and contains links to reviews elsewhere on the Web. Yesterday, I sung the praises of Apple's new iTunes affiliate program, which pays Web publishers a cut when they send business to the iTunes Music Store. It's a smart idea that will cause the Web to be peppered with links to Apple's music store. When I wrote that post, I had signed up for the affiliate program, but I hadn't actually been accepted yet. When you sign up, you must supply some details about your Web site -- its Web address, name, description, and more. Some higher power then reviews your application and either approves or denies it. It's now been about 24 hours, and I still haven't received notification that this site has been accepted into the affiliate program. But I have already received a notification that the terms of the program have changed. The changed terms appear in this lovely page. I haven't done so much horizontal scrolling since the days when Macs had 9-inch screens. Did I read it all? For that matter, did I read the even more obtuse terms and conditions, many of which appeared in ALL CAPITALS, that I agreed to when signing up in the first place? Apple has outsourced its affiliate program to LinkShare, which runs affiliate programs for dozens of major companies. So far, the entire process has not been what you'd call "consistent with the Macintosh user experience." I'm hoping the process of creating affiliate links will be easier than the process of applying to begin with. Oh, and a quick word about the riches that await. Like many affiliate programs, the iTunes program doesn't write you a check until your earnings reach a specific amount -- in this case, $25. I'd like to see the option of having your affiliate revenues applied to your iTunes account: sell some songs in order to buy others. Amazon.com offers a similar perk for its affiliate program: you can have Amazon simply send you a gift certificate for whatever amount you earned. It's convenient for affiliates and smart for Amazon, and Apple and LinkShare should adopt it for iTunes. Thus ends the first installment of The Affiliate Files. When (if) I'm accepted to the program, I'll create some links and report on the process. The New iMac is Cool, But How About that iTunes Affiliate Program? I'm glad to see that the G5 iMac is here -- or will be soon. I'll avoid the temptation to weigh in on it because I haven't seen one in the plastic yet. I will say that I'll miss the articulated display of the previous iMac. My wife uses a G4 iMac, and she constantly swivels the display around depending on where she's sitting or standing in her office. So much for resisting the temptation to weigh in. Whatever. I hope Apple sells a boatload of new iMacs, and I hope that everyone on that boat buys my iLife book and instructional DVD. Another development took place in the Mac world today, and in its own way, it's as significant and exciting as the new iMac. Apple has launched an affiliate program for the iTunes Music Store. It's now possible for anyone who has a Web site to make money by sending customers to the iTunes Music Store. I've been an Amazon.com affiliate for years. When you, dear readers, buy one of my books by clicking on a link on this site (like this link for my iLife book or this one for my eBay seller's guide), I get a little commission, a kickback, from Amazon. It doesn't cost you anything extra, but I get a little something. And I mean "little." I'm not getting rich from my affiliate links, but they do help put biscuits in my dog's maw. Now that Apple has introduced an affiliate program for the iTunes Music Store, I -- and millions of other people with Web sites large and small -- can earn a little something extra something when they send eager music buyers to the iTunes store. If I tell you that I've been digging the music of German electronic group De-Phazz and you buy a few of their tunes, you've just helped pay for a Milk Bone for Sophie. For the vast majority of Web publishers who participate in affiliate programs, revenues are indeed in the "contribute to my Milk Bone fund" range. But for the likes of Amazon -- and now, Apple -- affiliate programs are a powerful viral marketing vehicle. It's simple: when you provide financial incentive for millions of sites to link to you, you increase the chance that they will. Correct me if I'm wrong, but no competing online music site provides an affiliate program. Not Real, not Napster, not Sony, not Microsoft. And that's the real point to this rambling post: by offering a little kickback to everyone with a Web site, Apple has guaranteed that the Web will be filled with millions of links to songs, artists, and albums that it's selling. You'll soon see iTunes affiliate links littering everything from blogs to major entertainment sites. In a world where competing services threaten to erode Apple's significant lead, that means something. The new iMac? Sweet. The new iTunes affiliate program? Brilliant.